The hyrax is a small to medium sized mammal with a rounded body, short stubby legs, small tail and cute face. There are a total of four living species that make up the entire order Hyracoidea, all with superficially similar looks. They have a wide geographical and altitudinal range in Africa and parts of the Middle East, where they occupy a number of different habitats as depicted in their common names (see below), but are famous for liking a rocky outcrop to sunbath on that has easy access to hiding places from predators when tanning. However, similar to another recent Taxon of the Day Procyon, they are finding these requirements elsewhere, most notably in urban areas causing them to achieve pest status in some places. To enable them to scramble up rocks at fast pace they have special padded feet that sweat giving them added grip. Interestingly, they are a member of the Afrotheria group, which makes them closely related to elephants, a relationship that has been supported by fossil, morphological and more recently molecular analysis. The order Hyracoidea contains one family Procaviidae with three genera. The four remaining species are Dendrohyrax arboreus (Southern tree hyrax), Dendrohyrax dorsalis (the Western tree hyrax) Heterohyrax brucei (Yellow-spotted rock hyrax) and Procavia capensis or (Rock Hyrax) shown in the picture above. There are, not surprisingly considering its distribution, many more common and regional names than those given above, for example in South Africa the hyrax is affectionately known as a Dassie. Also of note is their sophisticated and romantic communication patterns, where the male sings quite complex songs to the female when trying to sell themselves. 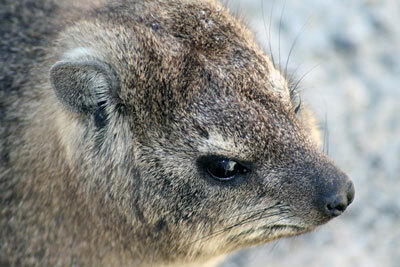 There are many videos of hyraxes on youtube and Taxon of the Day shares its favourite below.